I have to say I find winter to be a tough time of year. The warm heat in the Spring and Summer shining down has a positive effect on my muscles. Heat relaxes and has a calming feeling for me. In the Winter, I feel the joints in my hands stiffen and more knots seem prevelant, causing pain and stiffness in my body. I have mentioned the possibility of having SAD ( seasonal Affective Disorder) but have never checked on it with my doctor. I know this is not the only solution, but wearing bright colors or many colors can help your frame of mind. Instead of reaching for the black, grey, dark tones we might gravitate toward this time of year, try mixing bright colors or try color blocking. I guess I have felt my creative juices flowing a bit lately, ( with the exception of binge watching Black Mirror on Netflix) and part of my goals this year was to try new things in fashion. What’s the worst that can happen? Anyway, dressing can be an art, and I have always felt more on the artistic side, with music and my love of fashion/color. This “block” of blue-green teal – from my coat, found for a steal of $75 during the Mango Sale. I love the clean lines, one button and structured look. Plus its lighter, but warm enough for NC winters. Have you tried color blocking? Does wearing more color in the winter months improve your mood?. 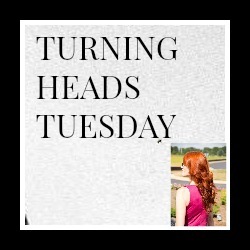 Time for TURNING HEADS TUESDAY LINKUP PARTY! LETS GET OUT OF THE WINTER DOLDRUMS AND LINKUP! THANK YOU FOR YOUR COMMENTS, THEY MAKE MY DAY! Gold dress- last season ( Zara) love this! I love wearing color Jess ❤ This color combination is perfect on you. I love it. Thanks for the inspiration!! Color blocking is a great idea! I’ve been having the winter blues, and looking forward to fun springy colors definitely helps. I need to check out Black Mirror! loving those earrings! looking super chic! I love color blocking and love this little background you shared on it with us! 🙂 These colors are just GORGEOUS together. I also love the neutral fish net hose, I didn’t catch that until you shared the closer up photo. What a gorgeous outfit! Hope you are well! The color combo in this outfit is perfect! I love it! What a beautiful colour combination Jess! I love your dress, the style is so elegant. Those velvet boots just finish off the outfit perfectly! Thanks for linking up, hope you have a great week! Oh snap!! I joined in your colorblocking escapades by coincidence!!! Great minds think alike. I love Piet Mondriaan! Love color blocking! Great colors Jess and what a beautiful brooche is that! I would have never thought to pair these colors together! I love the color of the coat, I’m so drawn to anything with a deep tone! Beautiful outfit! I love these colors together! That jacket is fabulous on you! How fun are your booties?! You look fabulous! I’m with you and love rich colors especially this time of the year. The colors in your post are amazing! And the ones you put together could not be more perfect. Love it! Jess, this color combination is brilliant! I love this look from head to toe! I’m so glad you enjoy color like I do, Jess!! This pairing is so, so pretty!! Love it all…the coat, the dress, the booties, but especially the fishnets! I never would have thought of that! Thanks also for the history of color blocking! Your posts are always so interesting and you are always beautiful! I’m pretty sure I have SAD too. It starts the week of daylight savings time. But I already start feeling better right about now when I notice the days getting a tad lighter (hey if I see a bit of daylight as I leave work, I am pleased!). But I also feel like a colorful fun outfit helps (hence my entire blog, lol)! I like to have fun with color and color blocking sometimes. I added a link to my red and pink color block from last year. It’s still one of my favorites! Oh, I just LOVE that teal coat, Jess! What a perfect color for your hair too 🙂 You always look great in those rich jeweled tones! I absolutely LOVE these colors together! And those booties are fabulous! I love the look of sock booties, but they would be so impractical for my Wisconsin climate. I love your choice of color Jess! Perfect for you and amazing palette! I totally love the whole look—you look amazing as always! I’m actually wearing this color combo today minus the pop of red, which by the way is perfection! I love this concept!! I especially love those boots! Those boots are definitely the perfect pop of color to cheer a girl up on a dreary Winter day! I don’t even know where to start because I like everything so much – the beautiful color of your coat first caught my eye and then those booties (love). But then the dress – the color is so pretty on you but the cut is DIVINE. And I do love your bag and fishnets! I’m hoping it warms up soon, I can only imagine what that super cold weather does to you. Come on down to Florida – we’re usually toasty warm! On Sunday I was chilly but we drove past a waterpark at Universal Studios and there were lines of people in bathing suits going down water slides! I guess it’s all perspective but when it dips under 70 here I am chilly! Well done Jess, great colour blocking- the teal and mustard so very good together. These colours look great together Jess. I’m thinking about trying some Mustard, and I already love Teal. Fantastic colors that look so good together! Great color blocking! This slightly mustard yellow looks so good on you. I love this entire look Jessica! I often wish I was more bold with my color/pattern choices, but I’m just not!😫 I sure do love colorful looks when I see them! I love Mondrian and always did a lesson on him with elementary. I still would like to have a Yves St. Laurent Mondrian inspired dress. I do more color blocking than print wearing. Love your choice of colors-a good remedy for winter days.